Hidden away among the notes on my phone, but always accessible, is “The list.” Are you a car person? Do you have your own list? And as a relatively young guy, I count myself extremely fortunate to have owned at least a few of these cars. Top on the list is a Porsche 356 Speedster. While mine is a replica, it still gives me much of the experience of owning one, including the endless smiles and compliments it generates from passers-by. For me, this satisfies the line-item on my list, especially since the current cost of the real thing is positively stratospheric. I also own a Porsche 911, which is the realization of one of the more vague entries on the list. Interestingly for cool cars, few of them (especially on my list) bear the same name for more than one generation. But like the Toyota Camry, the 911 has kept its moniker for decades. What I’d love to own is a 911 from the ‘60s, but I went the easy route – once again – and got one of the cheapest 911s available, a 996 generation from 2002. Prior to the Speedster, I had a 1966 MGB, my first classic. It was a joy to drive, and, for me, it embodies the look of the prototypical “classic roadster” better than just about any other car. And of course it was British racing green. On top of what I’ve owned, I also have secured a BMW Z8 as my birthright, having convinced my dad to buy one a few years ago. He recently declared publicly in newsprint that it goes to me when he can no longer drive it, hopefully many years from now. I have thusly embarked upon the task of acquainting myself more closely with these cars. My goal, if possible, is to meet someone with each of these cars and find out what it’s like to own one. Driving it would be a bonus but not required; I know how protective car people can be of their pride and joy, and I feel the same way. As luck would have it, though, the owner of the first car on this list that I approached was graciously willing to let me behind the wheel. Like my MGB, the Alfa Romeo Giulietta Spider perfectly embodies the classic roadster presence. But it kicks it up a notch with stunning Italian bodywork that in my mind makes it the most beautiful Alfa even produced. 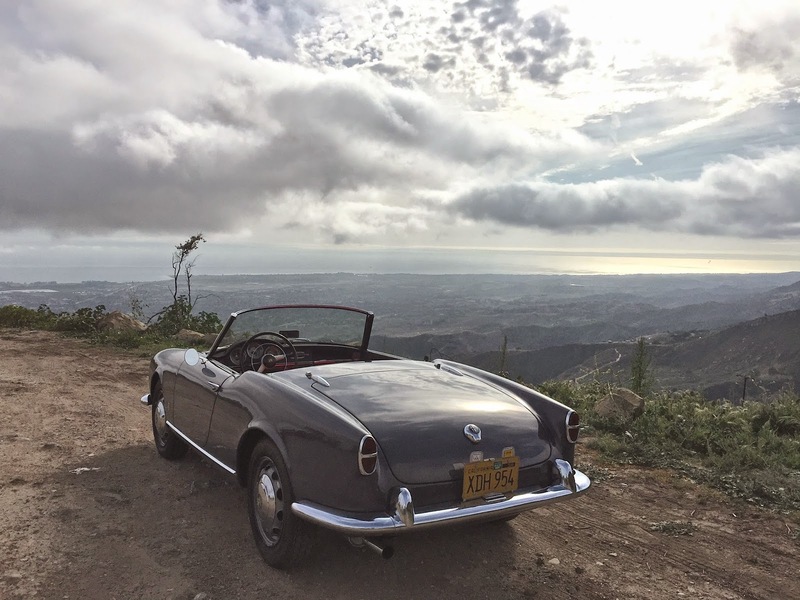 Robert Giaimo has owned his ‘58 Spider for around seven years, having acquired it from a guy in Laguna Beach who restored it from the ground up. “He was a true Alfa guy,” said Giaimo. “He was restoring a racing version of a Sprint.” No doubt the Giulietta’s renewal was done right. The car is not completely factory true, as the 4-speed was replaced with a 5-speed transmission, and the engine doesn’t happen to be the one that came with the car, but it’s the same spec. That 1.3L I-4 runs like a top, proving that the Italians can even make a four-pot motor sound lovely. We took the car up the 154 and on some side roads to enjoy a sporting jaunt. The clutch is fairly light, though its floor-mount does give it a bit of a different feel. The 75-hp engine feels spritely at higher revs, but it does require you to downshift in anticipation of tighter curves, lest you find yourself below a boil, where the engine is a bit sluggish. Since it’s not a numbers-matching engine, Giaimo is considering upgrading the car with a Veloce-spec powerplant, which would be around 1.6 liters. This would probably help things on the low end somewhat. Without power steering, the wheel does get fairly heavy around low-speed curves, so some muscle is required, but it lends precision to the handling. You get a classic experience from the wide, thin-rimmed wheel. shield grille makes an unequivocal announcement: this is an Alfa. The color combo is striking as well, with the gray paint darker than what is often paired with the bright red leather. It’s close to the original color, but it contains a slight purplish hue to draw out the interior color, and the combo is stunning. Giaimo and I also talked about the other cars in his life, past and present. Currently, the pride of his collection is his 1967 Lancia Flaminia Super Sport Zagato, of which there were only 150 built. You’ll see that at Cars & Coffee occasionally, and he usually has some ‘splainin’ to do to curious onlookers. He also has a ‘67 MINI Cooper S and a new Fiat 500 Abarth, his daily driver. His past includes such hits as an Audi Quattro, Alfa GTV, and Aston Martin V8 Vantage. And if the stars align, his future may hold a Renault Alpine rally car. Giaimo has been a presence in Santa Barbara for around 18 years, having grown up in Pasadena and spent time in Santa Monica and New York. His New York stint is unsurprising, considering his background in advertising. While he did work on the Mitsubishi account in the early ‘90s, when the brand was doing well in the U.S., his client portfolio actually ranged about as widely as his current passions, which include fashion, food, art and travel, among other things. And he seems to fully embrace the “lust for life” ethos that is so characteristic of the Santa Barbara area. He and his wife “belong to these wine clubs out in Santa Ynez, and it’s an excuse to take this car, pack a picnic and go out there and pick up wine,” he says. Rather than business cards, Giaimo carries what he calls “avocation cards,” with photos of the things that bring him joy in life. While the pursuit of cars is certainly a worthwhile endeavor on its own, it’s that much more enhanced when mixed with great experiences. his effort to restore polo’s status as an Olympic event for the first time since 1936. Curiously, when one approaches the stables that abut the field, one could be forgiven for thinking they’re at the main residence, due to its grand façade. It is in the forecourt of this building that Nesbitt will again host the after-party for the second annual Rally 4 Kids, which supports the United Boys & Girls Clubs of Santa Barbara County. 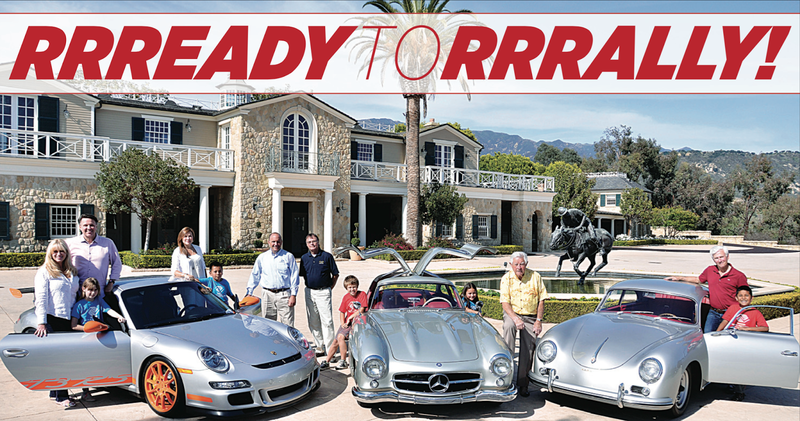 Montecito Journal is media sponsor for the nearly 200-mile event, scheduled for Saturday, May 9. “We had two-hundred-fifty people last year,” says Diana Starr Langley, co-chair of the event. “We netted over two-hundred thousand dollars, which is unheard of for a first-year event.” That makes the rally the largest fund- raiser for the clubs throughout the year. And the event is unique, particularly for Boys & Girls Clubs. “I’d never heard of a ‘rally’ before, and I’d been at Boys & Girls Clubs twenty-seven years,” says Michael Baker, newly installed CEO of United Boys & Girls Clubs of Santa Barbara County. He took the helm early this year, having previously run the clubs in Anaheim. its overwhelming success. The fundraising goal for this year is, simply stated, “more than last year.” There’s little doubt it will be another big success. “We’ve had a lot of buzz about it, and people call every single day,” says Baker. In fact, while last year’s Rally had 37 cars, as of this writing 43 cars – at an entry fee of $750 per car – have already committed for this year’s event. “People better act fast, though, ‘cause there’s only fifty spots,” adds Baker. Above that mark, it becomes more difficult, since the event would then be classified as a parade, requiring a different and more complicated set of rules. The organizers are also still seeking individuals and businesses interested in sponsoring the event, with a variety of benefits included at different levels, such as VIP tables and private servers at the after-party. The format of this year’s Rally is a bit different from the first. In contrast to last year’s “poker rally,” which involved collecting playing cards to assemble hands, this year is more about challenges, leaving less to chance. But the spirit of competition should still be fairly friendly, and the route designers have made sure to emphasize fun along the 200-mile circuit, which both starts and ends in Summerland. The driving kicks off from QAD. The route for this year has expanded from last year’s 180 miles, but it will also be different in that the directions are given based on landmarks, rather than pure mileage. The route will also include a “really fun” lunch stop, says Langley. Many of the stops involved wineries last year, including lunch, but there’s much less emphasis on that this year, so the drivers don’t miss out on the fun. And following Saturday’s rally, which should end around 6 pm, there’s a soirée at the Nesbitt Estate, where revelers will be able to see all the cars involved. There will be live entertainment, and the drivers can finally kick back and enjoy some of the free drinks. The hosted bar is probably a very good investment for the organizers, since it’ll loosen up the partygoers for the silent and live auctions that night. Langley says the silent block will be filled with great trips and car-related experiences, plus the typical lineup of restaurant, salon, and spa certificates. The live auction kicks it up even further, with some unique art pieces, such as a chance to have Jane Gottlieb photograph your car and create a hyper-colorful metal print piece. You can check out examples at janegottlieb.com. There are also experiences such as a seven-day trip for two to the Caribbean on the SeaDream yacht with a custom itinerary, a tour for 10 people of the Petersen Automotive Museum’s vault led by the museum director, and even a wine dinner for 24 people at the Wine Cask. Winemaker Doug Margerum hosts the dinner, and he’ll take care of the wine-food pairing for the whole night. such as Mazda, Microsoft, and FedEx. Art enthusiasts will have further outlets for their money (tax-deductible!) in the art of Bill Patterson. 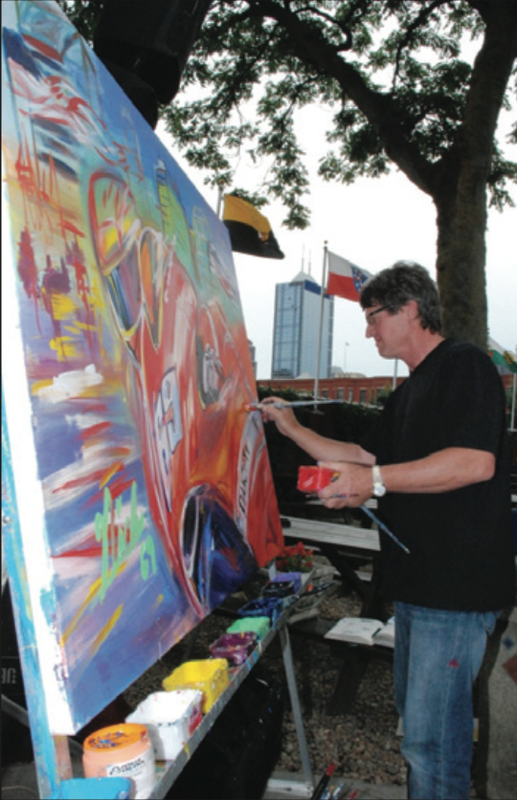 Patterson created the art for this year’s Long Beach Grand Prix. As the featured artist of the rally, Patterson will be creating works of art onsite, both Friday and Saturday nights. their cars immortalized on a 60-inch- by-42-inch canvas for just $2,500. These paintings will be created live at the Friday pre-party. That night there will be a sealed bidding process for two more paintings, which will take place on Saturday night. You can check out Patterson’s art, including his automotive portfolio and examples of pieces done live at events, at billpattersonart.com. If you’d like to grab one of those two Friday spots, you can contact Diana Starr Langley at (805) 452-8083. According to Patterson’s website, the honor has sold for as much as $41,000, so consider yourself lucky if you happen to be reading this early Thursday morning. While the Friday party is just for drivers and navigators, you don’t have to be signed up for the Rally to join the fun Saturday night. Tickets to the after-party are available at Rally4Kids.org. Fittingly, the money earned from the weekend will go toward transportation for the clubs. “The proceeds are helping us use our vans to pick up kids who can’t get to the Boys & Girls Club,” says Baker. The organization serves a far-flung set of communities – the union of six different clubs – where anyone up to 18 can come to its after-school programs, focusing on areas like personal development, health, fitness, and arts, all for just $40 per year. He went further to describe the impact of the event and the community he’s found in Santa Barbara, where he’s lived for only three months. For more information about joining the rally or attending the Friday or Saturday night party, you can call (805) 681-1315 or log on to www.rally4kids.org. 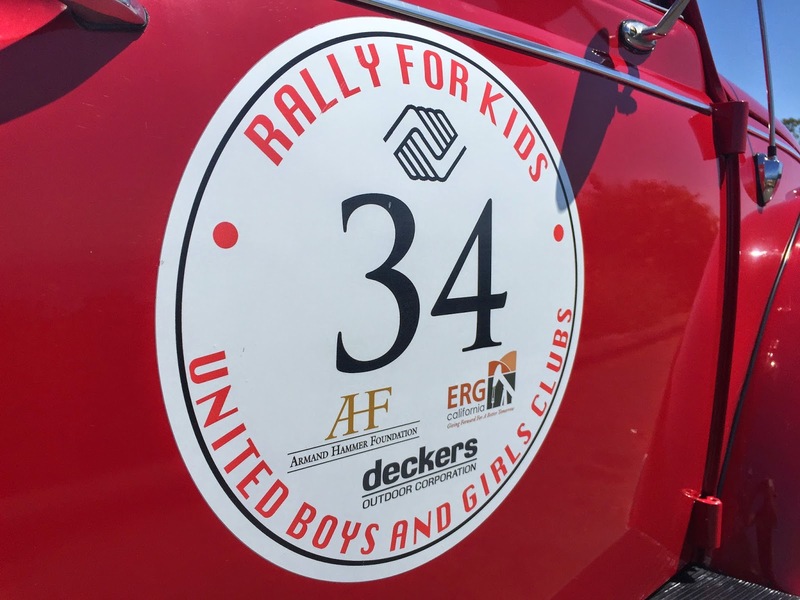 The second annual United Boys & Girls Clubs of Santa Barbara County Rally 4 Kids is just a month away, and everyone involved is getting revved up. Most of the driving spots are filled, and there is a great range of cars committed already. Looking at the list of drivers I noticed a strong contingent of Porsche enthusiasts, particularly those driving modern, water-cooled 911s. This definitely caught my eye, since I happen to be an owner myself. 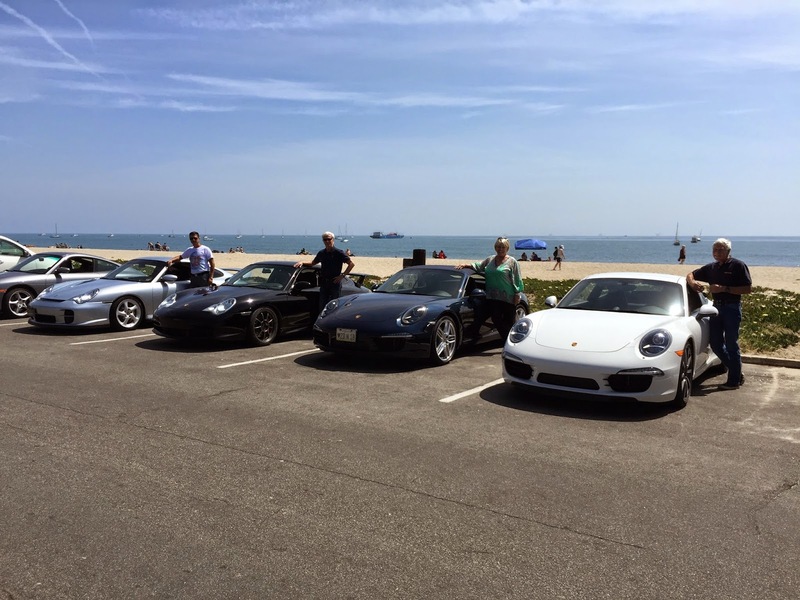 So I tracked down these drivers and put together a meeting of a sort of mini 911 owners’ club. First, a bit of background. The Porsche 911 succeeded the 356 as Porsche’s flagship sports car in 1964. While the brand came close to replacing the vaunted nameplate, the 911’s survival puts it among the oldest continuously produced models in the industry, along with vehicles such as the Toyota Land Cruiser and Ford Mustang (the Chevy Corvette skipped 1983). When parsing the history of the 911, car aficionados split the time into two eras, comprising the early air-cooled cars, which used similar engine technology to that of the original Volkswagen Beetle from which the first Porsche cars initially evolved; and the “modern” 911s which switched to a more contemporary liquid cooling system that is common to nearly every other car on the road. These are called “water-cooled,” as the coolant that you put in your car is mostly water, with additives that help it survive the wide range of temperatures an engine goes through. Once upon a time, there were Porsche “purists” who decried these more recent cars as not real Porsches (there are certainly still a few of these around). But along with the engine, the company re-engineered the entire car, giving it a sophisticated chassis that has formed the basis of what is still one of the most respected sports cars in the industry. But enough of the wonky details. Let me introduce four of the drivers who will be driving the roughly 200- mile winding, circuitous route from the offices of software company QAD in Summerland to the Nesbitt estate, grabbing scavenger items and generally having a blast. Jack Bianchi is a Santa Barbara native who has been involved in the car mechanic business for years. He retired in ‘06, but still works on cars in his shop downtown. It’s a long, narrow space that houses memorabilia from his adventures all over autodom, including lots of racing. We all assembled at Jack’s shop, and I got a look at a couple of the Grand Prix cars he works on. While the shop is only one car wide, it’s not a major issue, since the race cars sit in the back and are rarely extricated from the space, especially since the process of starting them is so involved. Due to the delicate tolerances of these engines, it’s a process that literally takes hours. At the rally, Bianchi will be at the helm of a white 911 Carrera S. His car is a 2012 model, making it one of the first of the latest generation of 911s, bearing the designation 991. 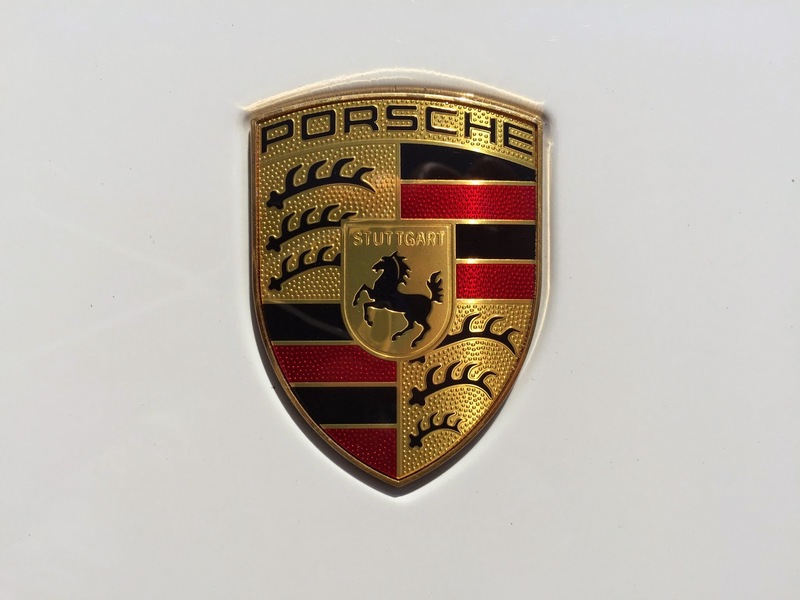 Porsche owners, like devotees of many auto brands, particularly German luxury marques, tend to refer to their cars by these code designa- tions. The 991 was a relatively big change from its predecessor, the 997, whose code indicates that it shared a fair amount of componentry with the first water-cooled 911, the 996. But Bianchi has owned 911s since well before the era of “modernity.” In fact, he owned just about every early model year from 1965 to ‘78, along with a host of Ferraris and even an Aston Martin DB4. For his modern 911, though, he has the most effusive praise. He was shocked at how little you needed to brake for the corners, but also at how balanced it was. His wife has found it to be a great car for road trips to San Francisco. He was so impressed with his new 911 that he wrote a note directly to the manufacturer to compliment them for it. He also called up his friend David Green, also a 911 owner, to insist that he drive the latest incarnation. Green hails from the East Coast originally, but came to Santa Barbara – by way of Malibu – in 1991 when his kids were starting school. He has found success in land development, and his past also includes a strong Porsche ownership history. Aside from his 2005 911, he currently owns a ‘59 356A coupe, and his wife drives a Cayenne with a diesel engine – which my experience suggests is one of the best diesel motors available in the auto market today. They are continually awed by the Cayenne’s range of up to 700 miles on a single tank. In the past, Green had a ‘73 911E and a ‘65 356C that his wife owned. His first real intro to what a modern 911 could be was his back road experience with a friend’s car, a 996 GT3. This was a track-focused version of the first water-cooled generation. “It was one of the most visceral cars I’ve ever driven,” he remarks. “The last of the mechanical cars, there’s no electronics in it at all,” he adds, refer- ring to the lack of computerized driving aids like stability control that are ubiquitous throughout modern cars. Green was so taken with the car that he bought one himself. “It has no insulation, no back seat,” he adds, also describing the stiffness of the suspension. “My sister-in-law describes it best as being ‘riding on a stone skipping across the water.’” It’s this black 2005 GT3 that Green will be driving in the Rally 4 Kids. Fortunately for his spine, though, it’s not his daily driver. That happens to be a GMC Yukon. Amil Garcia is perhaps the most extreme Porsche enthusiast in the group. Having grown up in Guatemala, he moved here in 1988 and formed a successful IT consulting practice. With that success, he has been able to make his myriad automotive dreams come true. Counting Porsches alone, Garcia has owned 73 of the cars. Still, this is only around half of the 140 cars that he’s owned in his life. “I just get bored,” he says. “Right now, I have three Porsches.” He brought his 2006 GT2 to our meeting, which he’ll be driving May 9. Like Green’s car, it’s a 996, but the GT2 is an even more extreme track tool, with a turbo engine that assaults the road with nearly 500 hp. This car was actually created by Porsche to race in its namesake class, GT2. As such, it has no air-conditioning and is festooned with a huge carbon fiber wing on the rear. Of the four 911 owners, Garcia is the only one who was among the field of 37 drivers at last year’s rally. He has great expectations for this year’s event, since he thought the organizers did a great job picking stops along the previous 180-mile route. “I had a great time, it was a lot of fun,” he says, and the roads and weather proved a perfect combination for the day. The one area he suggested could have been improved was the trip back from Lompoc at the end of the day, so he’ll likely enjoy the fact that this year’s route ends in the same place as the after-party, the Nesbitt estate. Ginni Dreier heard how much fun he had, and it was an easy task to persuade her to join the trail this year. Her husband, who doesn’t have much interest in cars, wasn’t so hot on the idea, so she declined organizer Diana Starr Langley’s invitation to participate last year. She explained that her husband wouldn’t be riding along “unless he’s dead and I put him in there” Weekend at Bernie’s style. But Garcia graciously offered to lend her his navigator (as the passenger is designated for the rally) for this year’s run. Dreier will be driving her 2014 Carrera S convertible in the event. Like Bianchi’s car it’s a 991, but those codes didn’t mean much to her prior to getting together with this group. She loves the way the car drives, but for expertise she relies heavily on Garcia, her friend of more than a decade. I asked Dreier if she considered herself an enthusiast, but she demurred, citing her lack of knowledge compared to the men sitting around her. This was where I insisted on disagreeing, however. My friends and family know me as an automotive expert, but it’s not necessarily what makes me an enthusiast. Just like most other “experts,” there will always be someone who knows more than I do about any particular topic. But an enthusiast is just that, someone who exhibits enthusiasm for a pursuit and who loves living new experiences. Dreier’s excitement about the Rally 4 Kids, like the excitement of the rest of the drivers involved, certainly qualifies her. And by the end of our discussion, she confidently declared, “I’m an enthusiast.” But of course, that doesn’t diminish her desire to fit in among the car geeks. Montecito car people love any excuse to get together with their toys. In recent years, the enthusiast community has really coalesced around some key people and events, and along the way became somewhat of a fundraising juggernaut. The newest event on that roster is the United Boys & Girls Clubs of Santa Barbara County’s Rally 4 Kids, which kicked off just last year. It was a rousing success, though, bringing in more than $200,000 for the network of organizations. This year, organizers Diana Starr Langley and Monte Wilson are kicking it up a notch May 9, expanding the field from 2014’s 37 cars to a maximum of 50, and choosing a 200-mile route, 20 miles up from last year. And this year’s event will take the form of a scavenger hunt, which heads out from Summerland and includes a “really fun” lunch event. & Girls clubs throughout the region. Anyone under 18 in a neighborhood served by the clubs can come there every day after school for just $40 per year. The clubs joined forces around a decade ago to create a network that has a deep impact throughout the county, and the rally helps them make up the difference between what members pay for their children and the true cost of the programs. There are lots of cool, fun cars that will be making the trip from Summerland along the route this year. In the lead-up to the event, the Journal will take a look at some of the cars and drivers that will be taking part. The first car we looked at never even had its decals removed from last year’s event. 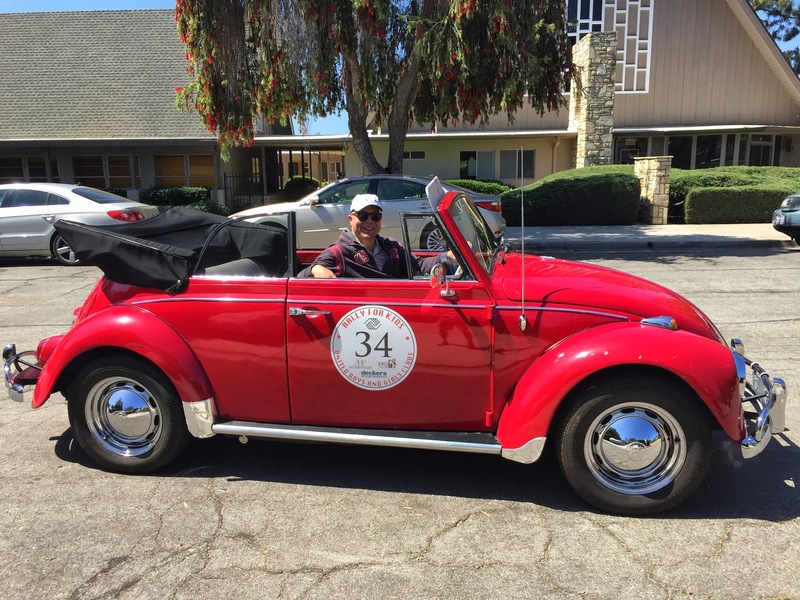 James Fenkner‘s 1967 VW Beetle convertible is a rolling smile, and his waving hand gets a lot of exercise. Outside the car, Fenkner looks like a bit of a bruiser, a buzz-headed Ray Liotta. But in that driver’s seat, he seems like the most approachable guy in the world. And he spends a lot of time there, since this happens to be his daily driver. “It was the first thing I bought when I moved to Santa Barbara” in 2009, he says, and his wife was willing to let him get a classic as long as it had room for his daughters in the back. Since an old convertible was on his mind, he was a bit restricted in his choices to fit the bill for both, but the Beetle was perfect. There was another driving force that linked Fenkner with this Beetle, and it stems from the sense of smell. Research actually shows that smell is one of the strongest triggers of memory, tying directly into the limbic system, so it’s unsurprising that Fenkner‘s Beetle would evoke such nostalgia. Fenkner offered me some time behind the wheel, and I happily obliged. The Beetle isn’t the most powerful car, but it had pep and good cheer. The familiar whir of the air- cooled engine is always there, making the car seem even more approachable, beyond just those friendly bug eyes and chrome bumper smile that are the muses of film animators the world over. There are certainly some quirks, like the lack of a tachometer – as in the Citroën 2CV, its speedo has some guiding hashmarks – the super-long arm reach to first and third gears, and the high clutch engagement, but it’s not tough to get used to. 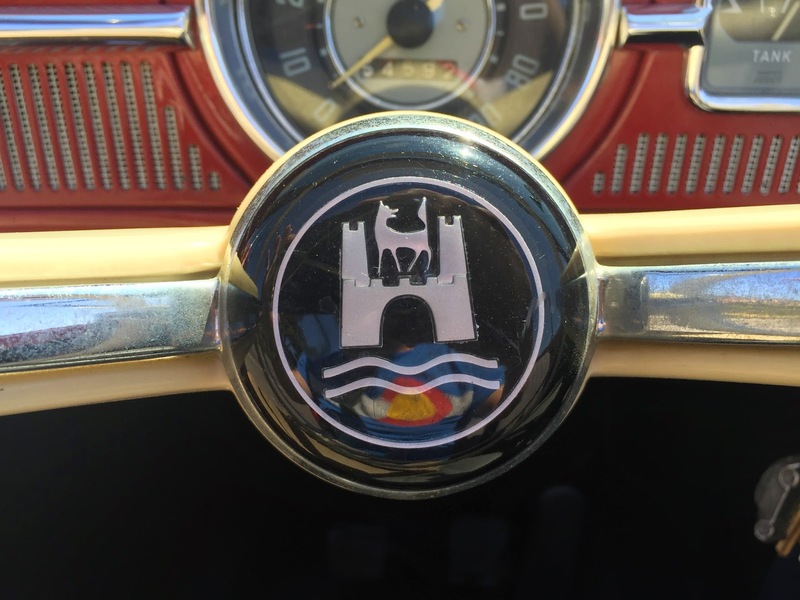 Like many of the other car people I’ve encountered in the Santa Barbara area, Fenkner has a fascinating story. After the collapse of the Soviet Union, there was huge opportunity in the Russian market. Fenkner jumped at the chance to capitalize on the newly open market under president Boris Yeltzin. George Soros was paying for American economists to teach in Russia, and since Fenkner had a finance background from working at Fidelity, he took the leap and taught for a year. He then started setting up brokerages in Eastern Europe, first in the Czech Republic and then back in Russia. “In the beginning, it was a truly free place,” he says. But 15 years later, things were different, and his search for a quality higher education for his eldest daughter reinforced the regressive nature of present-day Russia. Russia’s emphasis in their education system was more memorization and collectivism, in contrast to the American ideals of individual expression, and so Fenkner brought his family back to the U.S. to give his kids a better grounding in our way of thought. Santa Barbara to him represented somewhere that was at once safe and fun, but also had similar values to those of his family. He and his wife had visited only once on vacation, but they’d loved it so much that she insisted this would be their new home. Shortly after their move, they started hitting Cars & Coffee, an activity the whole family enjoyed. And Fenkner‘s connection with Wilson brought him to the rally. Fortunately for him, it isn’t a race, since he’d probably have a tough time keeping up with the Porsches and Ferraris. But he may accumulate more waves from onlookers than any other driver. Let’s hope that’s on the scavenger hunt list. The Rally 4 Kids takes place on Saturday, May 9, at 8 am, with an after-party at 6 pm at the Nesbitt Estate. Visit www. Rally4Kids.org for more information or call (805) 681-1315. If you have a story about a special car or piece of car culture in the local area, email Randy at rlioz11@gmail.com.